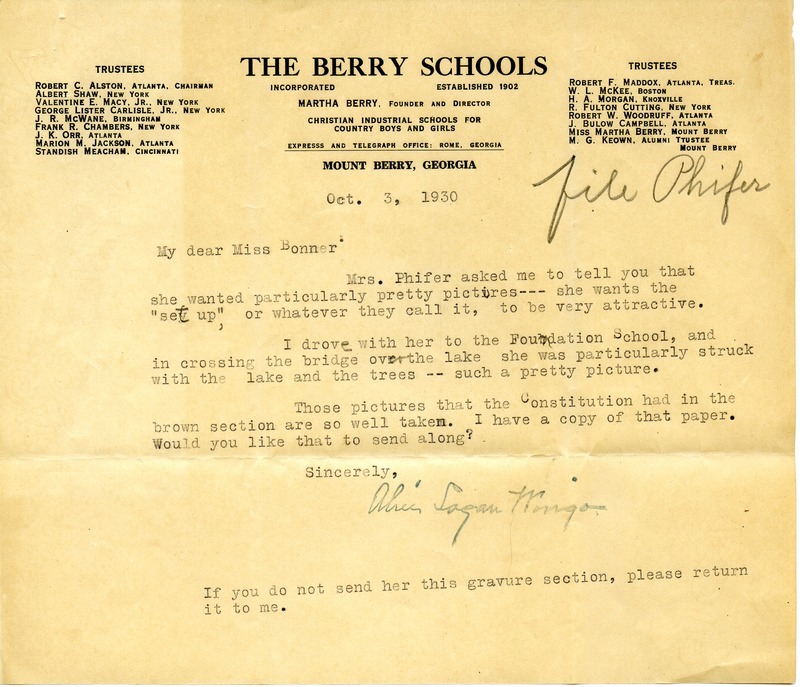 In this letter Alice Logan Wingo tells Miss Bonner thath Mrs. Phifer wants "pretty pictures," giving examples of the view crossing the lake to the Foundation School and photographs that were in the "brown section" of the Constitution. Alice Logan Wingo, “Letter to Bessie Bonner from Alice Logan Wingo.” Martha Berry Digital Archive. Eds. Schlitz, Stephanie A., Jordan Brannen, Sherre Harrington, Chelsea Risley, et al. Mount Berry: Berry College, 2014. accessed April 20, 2019, https://mbda.berry.edu/items/show/13713.